Medgar Evers appears at the bottom of the page. A couple of weeks ago I was working on an article for The Root, the online magazine, about locating World War I service records for a reader’s Mississippi ancestors. Knowing that the original service records are not digitized, but instead are housed at the National Archives in St. Louis, Missouri, I searched the Digital Archives of the Mississippi Department of Archives and History for any online collections that might assist the reader. My search was ultimately successful in that the MDAH has uploaded veterans’ service cards for World War I, but I also stumbled across a curious collection that I thought might interest our Vita Brevis readers: Educable Children Records (Mississippi), 1850–1894; 1906–1965. The collection consists of a list of school-age children submitted by the counties to Mississippi’s Secretary of State and Department of Education. 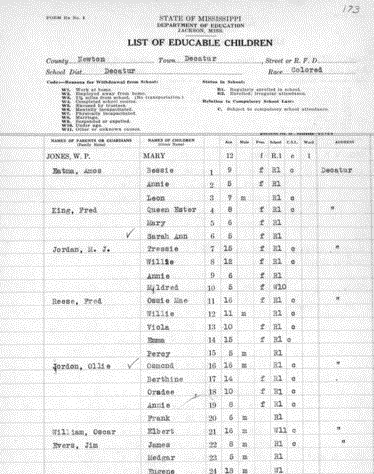 While not all lists are uniform, the kind of information you might find includes the child’s name, age, race, and address as well as parents’ names, information regarding levels of education and institution of schooling, and whether or not the student withdrew from the school system at any point. The MDAH highlights this collection as a finding aid for elusive ancestors who might not be found in traditional census and other records. In fact, this would be a particularly useful source to substitute for the damaged 1890 U.S. Census, as sometimes that twenty-year gap in records can throw a particularly tricky and inconvenient wrench into a family historian’s research efforts. While not all states have digitized collections such as this, their respective state archives might be able to inform you whether or not they have similar lists able to be searched manually. When I investigated the collection itself, I discovered that the MDAH prepared a learning guide for teachers with some ideas about how to work the collection into their lesson plans. The MDAH staff found four famous Mississippians within the lists to add a primary source component to significant Mississippi history topics. Renowned writer and Pulitzer Prize-winner Eudora Welty was found in the 1927 list for Jackson, the state capitol. She was seventeen years old and was living at 1119 Pinehurst Street with her brothers Walter (13) and Edward (12) and her father, C.W. [Christian Webb] Welty. This very house on Pinehurst still stands today as a museum to the prolific writer. Another cultural icon, Elvis Presley, can also be found in the lists. In 1945, ten-year-old Presley was living in Tupelo in the household of his father V.E. [Vernon Elvis] Presley, before his rise to fame and crowning as the King of Rock and Roll. The Educable Children Records also contain within them the origins of the civil rights movement in Mississippi, memorializing champions of equality in their school-aged form. Medgar Evers, a prominent leader of Mississippi’s chapter of the NAACP, can be found at the tender age of five living in Decatur with his father, Jim, and brothers, Eugene (18) and James (8). Mississippi’s fraught history of slavery and segregation is reflected in these records as African-American children were set apart both in the lists and in corresponding institutions according to race. During his career as a civil rights activist, Evers was instrumental in the campaign to reverse this division and, more specifically, to integrate the University of Mississippi. His efforts and those of many other activists are reflected in the history and record of another educable child: James Meredith. Nearly two decades before his historic admission to the state’s flagship university, seven-year-old J.H. 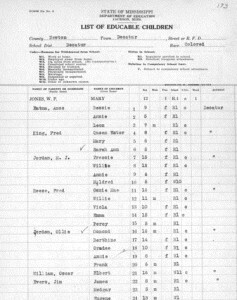 Meredith can be found in the 1941 list for Attala County in the city of Kosciusko with his father, Moses, and sister, Myra (13). Curious as to how my own family history coincided with the educable children, I searched the Lincoln County list for 1947 and found my grandmother, Doris Howell, 18, living in Brookhaven with my great-grandfather, Ray Howell, and great-uncles Ray (16) and Bobby (8). Doris died very young and I never had the opportunity to get to know her, so I often search for hints of her in various places. Taking the advice of a Vita Brevis post of a few months back, I also found her in a yearbook photo from the same year, bringing my research full circle. Digital Archives, Mississippi Department of Archives and History, http://mdah.state.ms.us/arrec/digital_archives/. “Learning Lagniappe: Educator Extras – Educable Children Records (Mississippi), 1850-1965,” Mississippi Department of Archives and History, http://mdah.state.ms.us/new/wp-content/uploads/2015/02/Lagniappe-Educable-Children-Records.pdf. Hinds County – City of Jackson, 1927, Page 149, Educable Children Records (Mississippi), 1850-1894; 1906-1965, Digital Archives, Mississippi Department of Archives and History, http://mdah.state.ms.us/arrec/digital_archives/educablechildren/Hinds%20-%20City%20of%20Jackson/1927/149/. “Visit, The Eudora Welty Foundation, https://eudorawelty.org/visit/. Lee County, 1945, Page 68, Educable Children Records (Mississippi), 1850-1894; 1906-1965, http://mdah.state.ms.us/arrec/digital_archives/educablechildren/Lee/1945/68/. Newton County, 1931, Page 177, Educable Children Records (Mississippi), 1850-1894; 1906-1965, http://mdah.state.ms.us/arrec/digital_archives/educablechildren/Newton/1931/177/. Attala County, 1941, Page 180, Educable Children Records (Mississippi), 1850-1894; 1906-1965, http://mdah.state.ms.us/arrec/digital_archives/educablechildren/Attala/1941/180/. Lincoln County, 1947, Page 50, Educable Children Records (Mississippi), 1850-1894; 1906-1965, http://mdah.state.ms.us/arrec/digital_archives/educablechildren/Lincoln/1947/50/. Brookhaven High School, 1947, Brookhaven, Mississippi, Ancestry.com. U.S., School Yearbooks, 1880-2012 [database on-line]. Provo, UT, USA: Ancestry.com Operations, Inc., 2010. I really enjoyed this look into an unknown or little known source. It is often so hard to stay on task when you come upon such an intriguing set of records. For me, that’sounds the fun…and “frustration” of searching, always ending up on the winding path. It’s interesting to note that all of the children you mention were living with their fathers, and there was no mention of their mothers. Do you know if this was why they might have been included in this list?